HP Exceeds Samsung in Tablet Sales in 2011 - Sengkuni Corps. 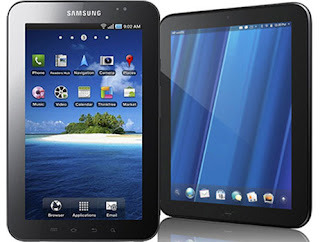 Samsung has produced a stunning tablet, Samsung Galaxy Tab, considered to be a major competitor of iPad in the tablet sales. However the reality HP which has made a tablet, TouchPad, better compete with Apple in tablet sales. According to NPD Group, HP has been selling the tablet in second-leading under the iPad. HP has announced to halt webOS projects which impact on their tablets cessation product development, TouchPad. To avoid losses that are too high, HP forced to lower prices that are already on the market up to $ 99. Apparently it received a market positive response so TouchPad selling surged. According to the NPD Group study, the HP gain market share tablet up to 17% by selling 204,000 units for the TouchPad. While Samsung managed to gain 16% market share by selling 192,000 units for the Samsung Galaxy Tab. Note that the NPD Group's study is not yet include Barnes & Noble, which repeatedly claimed that the Nook Color is the second best selling tablet in the market. It also ignores the Kindle Fire and Nook Tablet that might enliven the competitive struggle for sales in the market standings.